Today is Don't Fry Day. It's a day to remember to protect your skin from over exposure to the sun and help prevent skin cancer. Avoid burning or tanning, seek out the shade, cover your skin while out in the sun, generously apply sunblock, and use extra caution near water, snow and sand. So while you enjoy a beer on this hot Memorial Weekend - do so safely and protect your skin! Here's what's happening around the Colorado beerosphere today Friday, May 24th, 2013. Denver Beer Company (Denver) - It's going to be a warm day today - time for a Luau! Stop in today between 3pm - 7pm for a Luau. Come listen to Ukelele tunes, beer filled coconuts, refreshing shaved ice from Maui Shaved Ice Co, wear grass skirts, and attend the tapping of their Pineapple Pale Ale. Wear your favorite Hawaiian shirt and get your hula on. Crooked Stave Artisan Beer Project (Denver) - Their newest batch of HopSavant dry hopped with experimental hop 462, is now bottled and on draft in their tasting room. Come taste the difference side by side! Also, batch #4 of Surette was bottled yesterday and is available in the taproom starting now. Also, according to Eric Gorski's article in First Drafts, Crooked Stave may be planning a slightly different rainbow series of beers in the future along with bringing back many of their recent beers from their cellar reserve series. The article also discusses the crowd reaction to being shut out at a recent release. Good reading. Upslope Brewing Company (Boulder) - Grats to Upslope Brewing for being named the #5 fastest growing company in Boulder County by the Boulder County Business Report and the Mercury 100. Craft beer is still one of the fastest growing businesses around. Very Nice Brewing Company (Nederland) - The brewery WILL be open this Monday from noon to 6pm. Stop by during your weekend travels through the Nederland area. Plenty of beer will be on tap for this long weekend. Avery Brewing (Boulder) - Today's 5:00pm special tapping in the Avery Tap Room is Liliko'i Kepolo, their unfiltered Belgian White with Hawaiian passionfruit puree. This favorite will be on tap all weekend long. 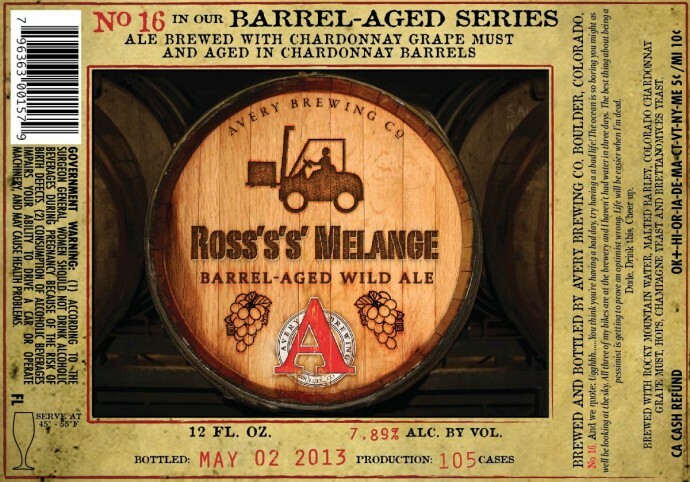 Also, #16 in their Barrel-aged series has just been announced and it's got a strange name: Ross's's' Malange Barrel-Aged Wild Ale. It's brewed with Chardonnay grape must and aged in Chardonnay barrels. Release date TBA. It was bottled on May 2nd and just 105 cases of 12oz bottles were packaged. It weighs in at 7.89% ABV. Funkwerks (Ft. Collins) - Funkwerks is introducing “Secret Sixtel” - a small batch of experimental beer. This will not be on the menu and will only be available in the taproom, while it lasts. Today they are tapping a Belgian Quad that was inspired by the Trappist breweries of Belgium, this Belgian Style Quadrupel is the base beer that Funkwerks is currently aging in oak bourbon barrels. It's a malt-forward, yet with a fruity aroma that smoothly transitions into flavors of caramel and dark fruit. Friday Fest (Greeley) - It's the first official Go-Cup Friday of the year in downtown Greeley. Stop down to your favorite watering hole along 9th Street plaza (like Patrick's Irish Pub with 31 craft beers on tap) and you can take your drink outside on the 9th Street Plaza. Beer and other beverages will be flowing freely. There will be plenty of live music each week to enjoy in one of Colorado's 1st outdoor entertainment zones. Every Friday from May 24th to September 20th the 9th Street Plaza will be filled with food, drink and fun. It's family friendly too and attendance is free! This week listen to the sounds of Moses Jones Band. Watch the amazing performers of Salida Circus. And view classic cars cruising "D" block downtown. More info on upcoming Friday Fests here. Pikes Peak Brewing (Monument) - Coming up on More Beer Monday is a tapping of their Incline Imperial IPA. It's theoretically rated at 185 IBU! Also, if you are so inclined (sorry for the pun), a group from the brewery will be hiking up the Manitou Incline. Meet at the PPBC parkint lot on Monday May 27th at 7am or at the Barr Trail Parking lot at 7:30am. If you join them for the hike you'll get $1 off your first beer. Bristol Brewing (Colorado Springs) - It's Friday - that means you can enjoy pints of Bristol Beehive Honey Wheat for just $3.50 from 6-9pm today. The Mountains are the place to be this Memorial Weekend for several outdoor festivals. Steamworks Brewing and Ska Brewing (Durango) - It is time to shine up your cruiser and get out to Ska Brewing at 5pm and then spin your way along the Animas to Steamworks via the Durango Cyclery. For those whose join in their celebration and pedal push their way will have a chance to win a Joint Effort Schwinn bicycle. BREW Pub & Kitchen (Durango) - Two new tastes to try! Cid - a Belgian Trappist-style ale with notes of fruit, bread and spice. And also Corey - a traditional IPA, medium bodied, citrusy nose and rich hop resin bitterness. Stop in for a brew and a bite! Paddles and Pints - River Side Happy Hour (Buena Vista) - Looking for a fun event this weekend? Head to Buena Vista tonight 4-8pm and Saturday 1-8pm for Paddles & Pints - it's a river side drinking event set up during the CKS PaddleFest. The Ark Valley Libation Society is sponsoring a special zone for drinking. Beverages will be available from Eddyline Brewing, Vino Salida, Deerhammer Distillery, Elevation Brewing, Woods High Mountain Distillery, Moonlight Pizza & Brewery, and Amicas. Watch paddlers head down the river and sip on a few cold drinks. Blues, Brews & BBQ (Beaver Creek Village) - Beaver Creek's favorite early summer festival returns for a 10th year! Join in this Saturday and Sunday from 12pm - 6pm each day as visiting chefs from all over the country as well as Vail Valley favorites serve up delicious BBQ while live entertainment rocks Beaver Creek Village, and of course, microbrews from across the country for your sampling pleasure. The microbrew festival happens on Saturday, May 25 from 1-5pm, and a beer garden will be open 12pm to 6pm both Saturday and Sunday. Plenty of great music, food and beer. Plus fun for the whole family. More info here. Festival of the Brewpubs (A-Basin) - This Sunday, May 26th fro 12pm to 4pm at A-Basin ski resort - It's a beach party in the mountains! Come celebrate the end of the ski season at A-Basin. This is their largest party of the year! Spend the day sampling beer from a variety of Summit County brewpubs for one low price per mug (must be 21). Breweries include Pug Ryan's, Breckenridge Brewery, Dillon Dam Brewery, and more. Enjoy live music 1-4pm, springtime skiing and much more. More information here.